Or 'what to expect when you're expecting spinach'. Although trees and perennial food crops are more likely to be part of the landscape architect's palette, spinach and other winter greens are crucial crops on year-round farms. When faced with a skeptical client demanding to know what the place will look like come winter, you might not need to know all these details ... but it won't hurt! Having taken a week off from harvesting Spinach last week, we are doubling down on it this week. Of all the leafy greens we grow, it turns out that spinach is actually the most cold hardy -- more so than its cousins chard and beet greens as well as greens like Kale and Collards. Not only does the cold we've been having this winter not damage the spinach, it makes it incredibly sweet and tender. We grow spinach primarily for baby leaves that we cut loose, wash, and bag. 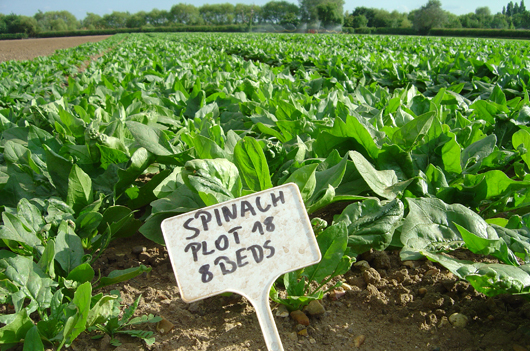 Grown this way, spinach is ready to harvest in 30-60 days, so we can plant it in between two other crops. ...Spinach [harvested this week is] from a field that was planted in mid-November. When the conditions are favorable, cut spinach will regrow its leaves. The second growth leaves are not as pretty and round as the baby ones, but they are still useable are quick-cooked or wilted spinach. We call this stage "teenage spinach". If we don't pick the spinach at the teenage stage, it keeps growing. It it doesn't get ruined by wind, rain or bugs, it will sometimes grow to a size where it can be cut at the root and bunched. We currently have two or three fields that have grown to this size, and they are mostly beautiful. Bunched spinach is most often used for cooking, as the leaves are fairly large and have a stronger grassy flavor. However, the flavor of ours is so sweet right now that it can certainly be chopped and tossed in salad, especially a warm salad (wilted).